Mercedes' Lewis Hamilton celebrates after winning the race. Formula One champion Lewis Hamilton saw victory fall into his lap at the Brazilian Grand Prix on Sunday as his Mercedes team clinched the constructors' title for the fifth year in a row. The win was Hamilton's 10th of the season and 72nd of his career. The Briton had already won the drivers' title for a fifth time. Hamilton started on pole position but was no match for Red Bull's Max Verstappen, who led until a collision with the Force India of already-lapped Esteban Ocon sent him into a spin, putting the champion back in front. Verstappen finished second, still seething, while Ferrari's Kimi Raikkonen took third. "That's it. That's the double, mate. 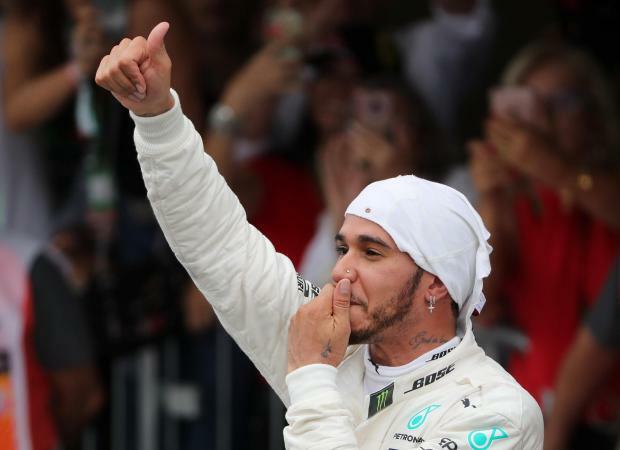 MercedesAMG are the world champs," Hamilton was told as he took the chequered flag at Interlagos after a race fraught with concerns about his tyres and engine. "It's been an incredible journey with them. This is what everyone worked for, for the whole year," said the ecstatic 33-year-old as the celebrations started with one race to go. "I've always told you how much of an honour it is to drive for them. Today was the best style that we could do it because we were struggling, we had problems to the end. We were a sitting duck at one stage." Only Ferrari have previously managed to win five championships in a row, taking six in succession during the Michael Schumacher era from 1999 to 2004. Verstappen, winner in Mexico two weeks ago, stepped up next to him on the podium but the Dutchman knew it should have been the top step. The collision was the talking point of the day, with arguments on both sides and angry scenes in the paddock afterwards. Ocon was handed a 10-second stop-and-go penalty for causing the collision but that came as no consolation for Verstappen, whose colourful language over the radio was largely bleeped out for television viewers. When the Dutchman found Ocon, at the post-race scales, matters became more physical with the Red Bull driver confronting the young Frenchman and giving him a push. "You do everything well, you go through the field, we had a great car and then by such an idiot you get taken out while he's being lapped. I have no words," said Verstappen.